Looking for a new food haven? The Buendia Food by the Court is the new food talk in town. It is situated at 34 Sen. Gil J. Puyat Avenue, Makate, Metro Manila, a new destination that allows patrons to get delighted with a range of food choices from different merchants and as well as entertainment. It opens from 5 PM to 12 AM. Among the pubs that you can find in Buendia Food by the Court is the Sausage Party. So, what are there that you need to know? As the name of the food pub implies, it is all about sausages. You can find here a huge variety of delectable European sausages, all meant to satisfy your fill. Savor the taste of sausages while enjoying the game! 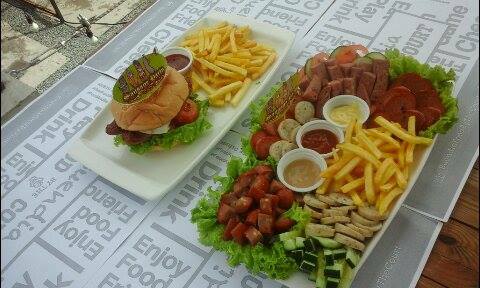 Single serving or in platter, Sausage Party has it the way you want it! These food choices come in a variety such as burgers with sausage or a platter of different sausages: Bratwurst, Weisswurst, Hungarian, Curry Wurst, Bacon and Cheese, and Cheesy Hungarian. As for the price, it comes in Php 130, Php 160, and Php 350 depending on your food choice. Sausage Party food choices are indeed a must-try. Savor the taste and satisfy your fill with a friendly price with the bonus of entertainment that will leave dull moments no space. Enjoy!